Puerto Rico, officially the Commonwealth of Puerto Rico,with 4 million inhabitants, is a self-governing unincorporated territory of the United States. The island is located in the northeastern Caribbean Sea, east of the Dominican Republic and west of the Virgin Islands. The capital of Puerto Rico is San Juan. Since 1917, people born in Puerto Rico are U.S. citizens. However, federal electoral law does not grant a vote to any citizen who does not live in, or qualify as an absentee resident in, one of the fifty states or the District of Columbia. Thus, people who have always lived in Puerto Rico cannot vote in federal elections, but people born in Puerto Rico and living in a state or in DC can vote. Starting around 1950, there was heavy migration from Puerto Rico to the Continental United States, particularly New York City, in search of better economic conditions. As of 2003, the U.S. Census Bureau estimates that more people of Puerto Rican birth or ancestry live in the U.S. than in Puerto Rico. 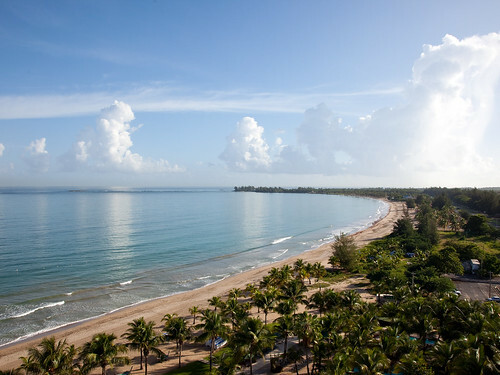 Tourism is an important component of Puerto Rican economy supplying an approximate $1.8 billion. In 1999, an estimated 5 million tourists visited the island, most from the U.S. Nearly a third of these are cruise ship passengers. The official languages are Spanish and English with Spanish being the primary language. English is taught as a second language in public and private schools from elementary levels to high school and in universities. Puerto Rican culture is a mix of four cultures, African (from the slaves), Taíno (Amerindians), Spanish, and more recently, North American. From Africans, the Puerto Ricans have obtained the « bomba and plena« , a type of music and dance including percussions and maracas. From the Amerindians (Taínos), they kept many names for their municipalities, foods, musical instruments like the güiro and maracas. Many words and other objects have originated from their localized language. From the Spanish they received the Spanish language, the Catholic religion and the vast majority of their cultural and moral values and traditions. From the United States they received the English language, the university system and the adoption of some holidays and practices. This entry was posted on janvier samedi, 2010 at 22:59	and is filed under 1ère, Other English-speaking countries. You can follow any responses to this entry through the RSS 2.0 feed. You can leave a response, or trackback from your own site.